F.M. Kirby Shakespeare Theatre on the Drew University campus in Madison NJ. Tues & Wed at 7:30pm; Thurs & Fri at 8; Sat at 2 & 8pm; Sun at 2 & 7:30. Last weekend I saw a play about a man who lies about pretty much everything. Despite claiming to be a stand-up guy – ardently religious even – he’d con you out of your socks given half a chance, and hit on your wife, groping her inappropriately (there’s another kind?) when your back is turned. Sounds like a recently-written play about some politician or other high-profile hypocrite, right? Nope; it is the 350-year old “Tartuffe,” by French playwright Jean-Baptiste Poquelin, aka Molière, and despite its unsavory title character, it is damn funny. Especially as being performed at the Shakespeare Theatre of New Jersey. Many classic works evoke comparison to modern times; that’s part of what makes them classics, and “Tartuffe” is a particularly vivid example. A scathing indictment of its own era’s religious and social hypocrisy, the play had to endure three re-writes before it could be performed publicly. Luis IV had passed on an early draft, but succumbed to pressure from clerics who objected to the theme of faux piety. However thus softened, Molière’s masterpiece, in Richard Wilbur’s translation, still packs a wallop – more so, perhaps, because it comes wrapped in a brilliant comic package. NJ Shakespeare artistic director Bonnie J. Monte’s production doesn’t push the message. Set here in the mid-18th Century (rather than the 17th), the “deep comedy” speaks for itself. In hilarious terms. Good-hearted Orgon (Patrick Toon) admits pauper Tartuffe (Brent Harris) into his home, where everyone except the host and his equally deluded mother, played amusingly by Vivian Reed in an anachronistic ‘down-home’ tone, recognizes the freeloader as a deliberate schemer. Tellingly, Tartuffe does not appear until well into the play, by which time we’ve heard Tartuffe variously condemned by the rest of the household as a bigot, a usurper, a Puritanical zealot and a lying scoundrel. In the course of a fast-moving two acts, Tartuffe gets himself affianced to Orgon’s daughter Mariane and assumes title to the entire estate, all through Orgon’s misguided largess. Not to worry; the Guest from Hell is exposed and arrested in an ending that has drawn scrutiny through the years for its abruptness, but hey, all plays have to end, and you can’t let the scoundrel win out. Just be cool with it. The NJ cast of a dozen are all on the same wavelength, so to speak (with the one intentional exception), which is not a toss-off compliment considering the period style and the rhyming dialogue. 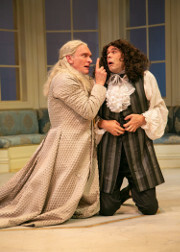 Harris’s Tartuffe slithers about in a silver greatcoat like a daylight Dracula, while Toon’s naïve Orgon is equally believable as the all-too-willing victim, who ignores the warnings of his hyper-active son Damis (Aaron McDaniel), his sensible brother Cléante (William Sturdivant), his daughter’s worthy suitor Valère (Mark Hawkins) and the women in his life. About those women: Caroline Kinsolving as Orgon’s young wife Elmire, Sarah Nicole Deaver as his daughter Mariane and Victoria Mack as household servant Dorine are as accomplished comedic actors as they are elegant models for designer Nikki Delhomme’s gorgeous costumes. Subtle traces of up-to-date feminism in all three performances bring the play’s serious issues home without sacrificing any of Molière’s wit (or his and Wilbur’s nifty rhyme-scheme). Mariane’s cotton-candy pink and Elmire’s sky blue are set off perfectly by Orgon’s and his mom’s stark black. Servant-girl Dorine also gets a snappy outfit, as do son Demis and suitor Valère. It’s an equal-opportunity fashion show. Delia Bannon, Drew Dix and Garrett Gray are all effective in supporting roles, and Brittany Vasta’s open set leaves room for the goings-on without sacrificing the farce-required levels and doorways. Matthew J. Weisgable’s lighting is nice and bright, the better to see – and enjoy – this comedic romp (with just enough of an edge).